Local residents learn more about how Kearney helps them at Parlier Earth Day. Over 30 nonprofit, educational and government organizations attended Parlier Earth Day in April, where about 2000 local residents increased their awareness of how these groups can help them. Kearney Agricultural Research and Extension Center provided information on how we work on integrated pest management strategies and uses for biopesticides to help ensure an abundant supply of affordable and safe food. Attendees were very interested in discussing how this work at Kearney directly helped them. 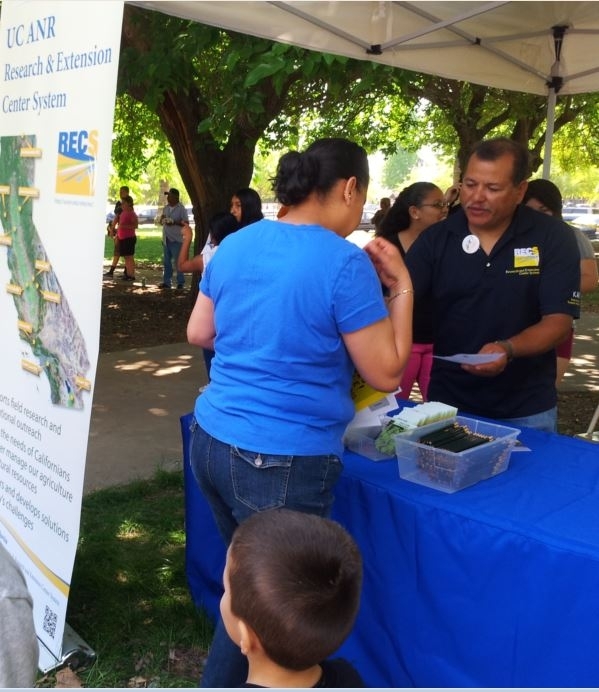 Rodolfo Cisneros sharing information about Kearney with a local resident at the 2014 Parlier Earth Day.